I'm a very genuine and positive person with a great sense of humour, living in Adelaide, South Australia. I travel to Ireland almost every year and I love to laugh and experience new things in my life. I have a real dry irish wit (so I'm told) I have a love for many things including music, live theatre, rock concerts and who can forget a good old pint of Guinness. I love to sing and visit karaoke bars with my fiends. I love spending quality time with family and friends. I believe that if you're lucky enough to get a second chance at love grab it with both hands. Life's short and there are no re-runs, lol. If you want to know anything else about me just message and say hi. I would be very pleased to chat with you. PS: No photo = No Contact. You know what i look like, fair is fair but I would expect you to provide a photo of you. He would need to have a gr8 sense of humour. Preferably Irish. Low stress levels. Accepting of who I am and love me for just being me. Patient and kind. Romantic and comfortable to be around. Enjoy the same interests in life as me. I also like to be individually together. I am not a smotherer. I am very Honest and faithful to my partner, I have a lot of love to give and would relocate to be with him if the need be. I'm not fussed. I am a lady who is easily pleased and a hopeless romantic. Somewhere we both agreed on. As long as we are both comfortable and can be ourselves. Would be nice to want to see each other again, and have regular contact with each other. justrite4U is a Female dating in South Australia, Australia. 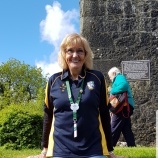 Check the description of this 63 years old profile, she is White/Caucasian and Catholic maybe this matches your profile description and you can both start dating in Ireland for free. The stars says she is a Taurus maybe you should check your horoscope and match up your star sign.